This ruling concerns a product that resulting from the contributions of two people who were formerly friends. 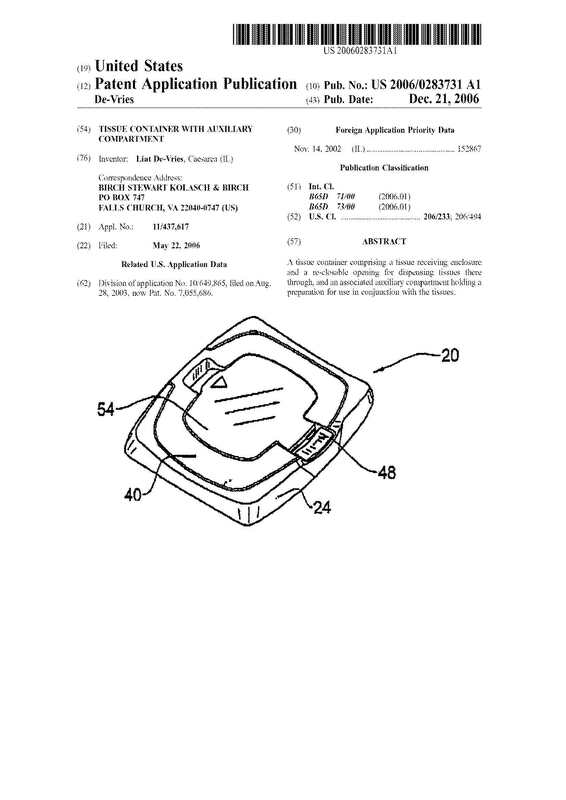 A patent application was filed that named both people as both inventors and applicants. Later, after powers-of-attorney signed by each of the named inventor – applicants had been filed, there was an attempt to ‘correct an office error’, to list one of them as an inventor only. The corresponding PCT application and the national phase entry applications, including two issued patents in the United States only bore the name of one inventor and applicant. In an Opposition ruling the Israel Patent Office has now accepted that the second named inventor is indeed an inventor and also an owner. Apart from emphasizing the need to determine who is the inventor and who is the owner of an invention when the patent is filed, the need to put everything into writing, and the dangers of working with friends, the case raises interesting questions regarding what contribution to reducing a patent to practice entitles someone to recognition as an inventor and whether this standard is the same in all jurisdictions. It also raises interesting questions regarding the duties and responsibilities of the patent attorney to ascertain the facts, or at least to avoid signing on contradictory statements regarding ownership and invention in different jurisdictions. with an adjacent container for nappy cream. The Application was filed back in November 2002 and listed Boaz Krystal and Liat De-Vries as inventors and owners. The patent application was allowed at the end of June 2010. Subsequently, an Opposition was filed by WET-NAPS LTD and Liat De-Vries on 4 October 2010 under Section 31(3) of the Israel Patent Law 1967 on the grounds that Boaz Krystal was not in fact an owner, and that the patent was exclusively owned by Ms Liat De-Vries. Mr Boaz Krystal and his wife Mrs Dorit Krystal each submitted affidavits. Mrs Liat De-Vries submitted a primary affidavit and a supplementary one in response to Mr Boaz Krystal’s affidavit. Wet-Naps Ltd. is owned by Mr Ilan De-Vries, who is Mrs Liat De-Vries’ husband. He also submitted an affidavit on behalf of the company. Mr David De-Vries, a patent attorney at Reinhold Cohn & Partners who drafted and filed the application and is a cousin of Mr Ilan De-Vries, Ms Ronit Tal who is an acquaintance of Liat De-Vries and Mr Yoram Hadar who is an industrial designer, also submitted affidavits. A hearing was held and the parties submitted their summaries. Wet-Nap Ltd manufactures, exports and markets wet-wipes. The company had a business relationship with Packtop Ltd., a company directed by Mr Boaz Krystal that distributes wet-wipes amongst other things. At the time of filing, both the Krystals and the De-Vries couple were good friends. There is no argument that Mr Boaz Krystal and Mrs Liat De-Vries met at the Wet-Nap Ltd factory, where Mr Boaz Krystal heard the idea of including baby ointment together with a package of wet-wipes from Mrs Liat De-Vries. There is also no argument that Mr Boaz Krystal and Mrs Liat De-Vries had some kind of collaboration, to develop and improve this invention and to file a patent application for it. Eventually a joint application was filed in both Mr Boaz Krystal and Mrs Liat De-Vries names. However, the parties disagree regarding Mr Krystal’s contribution to the development of the invention and consequently disagree regarding whether he is to be considered an inventor and owner of the patent. The Application was filed in November 2002 by Reinhold Cohn Patent Attorneys. The Application form lists both Mr Boaz Krystal and Mrs Liat De-Vries as joint owners due to them being inventions. Both parties filed Powers of Attorney, and the Filing Certificate gives both names. On 10 December 2002, Adv. Edna Haruti, now Mr Krystal’s representative, submitted a letter in which it was stated that Mr Krystal was a joint owner together with Mrs Liat De-Vries as he had invented the tissue container with auxiliary compartment together with her. Adv. Edna Haruti also noted that registration of the patent in the name of Mrs Liat De-Vries only was contrary to the agreement between the parties. On 2 February 2003 Patent Attorney Shimon Shalit, then Senior Examiner in charge of formalities at the Israel Patent Office, responded to both Reinhold Cohn and to Mr Krystal that Mr Krystal could not be removed as an owner in the application as filed, since there was no indication that he had assigned his invention to Mrs Liat De-Vries prior to the application being filed. In absence of such proof, since Mr Krystal was not an employee of Mrs De-Vries, by virtue of being a co-inventor, he was also a co-owner. (As an aside – On 12 March 2006 Mrs De-Vries submitted a divisional application of IL 152867 for certain applications of the invention. This divisional application (IL 174309) was examined, allowed and issued as a patent. On 1 December 2010 IL 174309 lapsed due to failure to pay the renewal fees. That patent is not directly relevant to this Opposition, but Wet-Naps Ltd and Liat De-Vries related to it in their claims). In the protocol of a hearing held on 5 February 2007 before then Deputy Commissioner Noah Smulevezh it was decided to defer the issue of ownership until the examination of the application was completed. It was further ruled that Reinhold Cohn would be address of record, but would update Mr Krystal or his representative regarding actions taken to get his input before responding to office actions. The patent application was eventually allowed and published for opposition purposes, resulting in this opposition proceeding. Mrs De-Vries and Wet-Naps Ltd claimed to have thought of the idea and developed the invention whereas Mr Krystal had merely provided technical drawings and a business plan for commercializing the product. They alleged that during the period in question, Mr Krystal provided technical and consultancy services to the company as almost an in-house service provider and as such, was exposed to the invention. They further claimed that Mr Yoram Hadar (industrial designer) and Patent Attorney David De-Vries provided sketches for the product that eventually evolved into the patent application. They further alleged that Mr Krystal had suggested a specific implementation (embodiment?) – storing the cream in a blister pack or sachets, which developed into the divisional application submitted by Mrs De-Vries. They claimed that Mr Krystal had decided NOT to pay the renewal fee which resulted in the divisional application becoming abandoned. According to the Opposers, Mr Krystal should never have been listed as an owner, and this was simply an office mistake which should simply be rectified, removing his name as an owner and leaving it as an inventor only. Since Mrs De-Vries transferred her rights to Wet-Naps Ltd, the company should be listed as the sole owner. Furthermore, Mrs De-Vries claimed that throughout the work opposite Reinhold Cohn, she made it clear to Mr Krystal that she was the sole owner and he hadn’t disputed this. She had registered Mr Krystal as an inventor simply as a symbol of respect and friendship. Finally, the Opposer claimed that Mr Krystal had acted as a damaging bully against the De-Vries couple and his claim of being an inventor was and remains illegitimate and wrong. Mr Boaz Krystal stated that the application was filed jointly in both his and Mrs Liat De-Vries names since they were joint inventors of the claimed invention. There was no written agreement regarding ownership, and in the absence of this, both inventors have equal rights in the invention. Mr Krystal conceded that the idea of incl uding the ointment within the wet-wipe package was Mrs De-Vries’. However, he claimed to have reduced the idea to practice by suggesting a number of embodiments. These embodiments were stated in the application and so Mr Krystal was registered as a joint inventor-owner. Furthermore, Mr Krystal was present in the meetings with the Patent Attorney and had supplied sketches and information to the relevant parties. This rendered him a full partner in the invention. He went on to claim that the Opposers had failed to reach the significant level of proof required to substantiate their allegations that his name as an inventor and as an owner (applicant) was included by mistake. Additionally, Mr Krystal stated that the Opposers had worked against him for years and had tried to create a one-sided strategy to cancel his rights in the invention of the patent. He claimed that the filing of the divisional and the striking of his name as an applicant were illegal unilateral actions against him. (a) An invention or patent may be jointly owned by more than one individual. (b) If an invention or patent is jointly owned, the joint owners are to be considered as having equal shares if there is no written agreement or law to the contrary. A disagreement developed between Mr Krystal and the Opposers as to whether there was joint ownership in the patent under discussion. It is therefore necessary to determine whether Mrs De-Vries is the sole owner or whether both parties are joint-owners. The relevant Law is section 1 and section 76 of the Israel Patent Law. From here it transpires that the owners by Law fall into two categories: (1) the inventors themselves, and (2) ‘persons who derive title under him’ meaning those that are entitled to ownership by law, by assignment or by agreement. The person who submitted a patent application [is] deemed the owner of the invention, as long as the contrary has not been proven. The presumption of ownership in Section 76 places the onus and the burden of proof on the Opposer under Section 31(3) of the Law. So any doubt regarding whether the Opposer has a convincing case serves the Applicant’s interests. See Civil Appeal 296/82 Dr Isai Nevensal vs. Jersey Nuclear – Avco Isotope Inc. Page 304, 27 May 1986. There is no dispute that Mr Krystal is an APPLICANT in this instance. The Application was lying before the Adjudicator Ms Yaara Shoshani Caspi as she wrote this decision, [It seems to me it wasn’t just the Application that was lying – MF] and it was clear to her that he was listed as an inventor-applicant. The establishes the assumption of Section 76 that he is indeed an owner of the invention. Thus the legal question is whether the Opposers successfully rebutted this presumption by virtue of the evidence they submitted in support of their claims? To make this determination Ms Shoshani Caspi ruled that there is a need to carefully consider which party’s version of events is preferable and whose testimony is more believable, more reasonable and better supported by the extensive documentation submitted over the proceeding. In the circumstances, it is not easy to come to clear conclusions since this is an instance where business and friendship are mixed together, which, over time and without written agreements, led to the parties disagreeing. That said, at the end of the day, Mr Krystal’s version of events was found believable and better fitting with the documents filed by the parties. Mr Krystal’s evidence was, at times, emotional, but this did not detract from its veracity and persuasiveness. The Opposer’s counsel related to various statements made by Mr Krystal in his affidavit and under cross-examination, to try to show contradictions. However, Ms Yaara Shoshani Caspi did not find his attempts persuasive. In contradistinction, Mrs De-Vries failed to defend her version of events under cross-examination, and sometimes submitted unsatisfactory or contradictory answers or answers that did not sit with the documents of record. Consequently, Ms Shoshani Caspi preferred Mr Krystal’s version of events. Mrs Krystal’s testimony supports her husband’s with regard to the resources invested in the invention. That said, without first-hand knowledge of how the invention came into being and the respective rights of ownership between Mrs De-Vries and Mr Krystal, and her being Mr Krystal’s wife and therefore not neutral, her evidence is not given significant weight. As to the testimony submitted by Mr De-Vries [Ilan, not Patent Attorney David – MF], him being married to Mrs Liat De-Vries results in relying on his testimony requiring care. Furthermore, like Mrs Krystal, Mr De-Vries lacked firsthand knowledge regarding how the invention came into effect (see for example, page 79 lines 15-16 of the protocol). Additionally, the Adjudicator, Ms Shoshani Caspi, found it difficult to resolve Mr De-Vries’ version of events with the evidence. Neither Ms Ronit Tal nor Mr Hadar were present to defend their Affidavits under cross-examination. Adv. Eyal Price, acting on behalf of the Opposers, argued that since the Applicant had NOT requested the right to cross-examine them, their testimony should be accepted at face value. The Adjudicator noted that as a matter of law (regulation 69 of the Patent Regulations 1968) he was correct. Nevertheless, she was surprised that the Opposers did not bring along their witnesses in support of their written statements. David De-Vries, the Patent Attorney at Reinhold Cohn who had drafted the application, filed the POAs and then claimed an office mistake, declared under cross-examination that he was unable to shed light on how the invention came into being and who the inventor(s) was/were. The Adjudicator had the impression that Patent Attorney David De-Vries had received information from his client and had followed their orders to the best of his ability. His testimony should be considered in this narrow context and cannot shed light on the identities of the actual inventors and owners. Is Mr Krystal a co-inventor of the invention? The parties disagree as to whether Mr Krystal is a co-inventor of the invention in the applied for patent. Section 39 of the Patent Law provides the inventor with the right to have his name mentioned as such [based on Paris Convention -MF]. The owner, on the other hand, has much wider rights under the Patent Law. A known, long-established Law provides that in order to be considered an inventor, it is not enough to claim to have had a simple idea. The main test of inventorship of an idea is whether it includes a way of implementing or if implementation is simple development work. See Opposition to 14865 Emmanuel Shefi vs. M.Y. (The Institute of Productivity in the Ministry of Employment), 4 September 1964. This rule is discussed in Amir Friedman’s book “Patents, Legislation, Case-Law and Comparative Law” page 188. According to the Opposer, Mrs De-Vries is the sole-inventor of the invention claimed in the Application and that Mr Krystal did not contribute to the reduction to practice. She alleges that Mr Krystal suggested an idea for automating the production of the lid that works in accordance with her invention; i.e. a lid with a compartment for the preparation, but this was never developed or implemented. She also charged that Mr Krystal provided technical services to Wet-Nap over the years, was almost one of the family in the factory and had exposure to all the trade secrets regarding machinery and products. Consequently, she had consulted with him regarding her invention. Mrs De-Vries claimed that his name being listed as an inventor was due to good-will and as a result of the specific implementations that he had proposed, such as storing the cream in blister packs, and as a symbol of her appreciation for his willingness to prepare patent drawings and provide them to Patent Attorney David De-Vries. Mr Krystal’s version of events is that Mrs De-Vries presented him with a simple idea to store an ointment with in the package of wet-wipes, and he did the work required to develop this into an invention, drawing on his vast experience and expertise in the field. He claimed and reiterated several times under cross-examination that he drew a number of sketches for implementation when she first approached him with her idea, and he also contributed several additional applications. He directed her to file a patent application for the applications to protect the invention. He also claimed that he was specifically asked to contribute half the patent drafting fees. It was clear to the Adjudicator that there was a business relationship between Mr Krystal and Mrs Liat De-Vries prior to the patent being filed. She also sees no reason to doubt that the basic idea was explained to Mrs Tal at a meeting between them sometime in 2002. Nevertheless, she was not convinced that either Mr Ilan or Mrs Liat De-Vries testimonies contradicted Mr Krystal’s version of events, which she found persuasive and supported by external evidence, that it was he who found the way to implement the idea and did so during his first meeting with Mrs Liat De-Vries on the subject. No-one disputes that there was a collaboration between Mr Krystal and Mrs De-Vries to develop the invention, so the parties agree that he had some contribution to the invention. This is reflected in the request to correct the patent application which was submitted on behalf of Mrs De-Vries and states explicitly that Mr Krystal should be identified as an inventor. Mr Krystal further testified under cross-examination that he worked day and night to develop the invention and to do a ‘patent survey’ (his words), in an attempt to differentiate the solution from the similar products that could negate the patentability of the invention (Protocol page 156, lines 8-17). Furthermore, although he was not party to the conception of the invention, it appears that Patent Attorney David De-Vries understood that two co-inventors had met with him. Patent Attorney David De-Vries acknowledged that he received a Power of Attorney from Mr Krystal as an inventor (page 11 lines 19-20) and that he sat down and wrote up the invention in accordance with what the two inventions told him (Protocol Page 26 lines 4-5); that Mrs De-Vries came with Mr Krystal as her partner with respect to the invention (Protocol Page 29 line 15). It was also proved to the Adjudicator’s satisfaction that Mr Krystal produced a large number of drawings and developed the product so that the invention had a number of applications. In this regard, the Adjudicator received the impression that these drawings were not created at Mrs De-Vries’ request or under her guidance as the Opposers claimed. In this regard, the Adjudicator referred to the first appendix to Mr Krystal’s affidavit that included sketches with accompanying explanations, which match those of the patent application, and which Mrs De-Vries herself acknowledged this (Page 116 lines 27-30 and Page 117 lines 1-3 of the Protocol). On the other hand, the Opposers did not manage to indicate specific illustrations within the patent specification that were separately and independently developed by Mrs De-Vries. It is noted that in the meetings held with Patent Attorney David De-Vries, there was no discussion of the Mrs Liat De-Vries and Mr Krystal’s separate contributions (Page 26 lines 4-9 of the Protocol). In conclusion, the Adjudicator Ms Shoshani Caspi considers that the evidence clearly provides a picture of two partners, Mr Boaz Krystal and Mrs Liat De-Vries, collaborating to advance a general idea into a patentable invention. Consequently one cannot but conclude that Mr Krystal is a co-inventor of the patent application. Is the Assumption of Ownership Rebutted? Since Mr Krystal is an inventor, he is an owner under Section 1 of the Patent Law. This raises the question whether in this case there is some reason that results in Mrs Liat De-Vries being ‘a person who derive title under him’ as the Law puts it. In other words, “Who is entitled to the invention by Law, by Assignment or by Consent?” If this is the case, it will be ruled that Mr Krystal is only entitled to be recognized as the inventor by having his name mentioned as such on the application [and the certificate – MF] but not recognized as an owner. Additionally, such a reason would have to be sufficient to overcome the presumption of Mr Krystal being an owner that is found in Section 76 of the Patent Law, since he is a named applicant. It is emphasized that the burden of proof is on the opposers to prove that they are the sole owners. of the application. Firstly, there is no evidence that Mr Krystal had ever assigned any rights to the Opposers and they didn’t even claim this. This is essentially what Mr Shimon Shalit determined on behalf of the patent office [when this issue was raised back in 2002, see above-MF]. The Adjudicator found it difficult to accept the Opposers’ version of events that Mr Krystal was always aware and agreed that he would not be listed as an co-owner together with Ms De-Vries. The Opposers’ version of events is apparently based on a claim that Mr Krystal was exposed to the idea and its implementation that was the basis of the patent application and was asked to help reduce it to practice since he was a consultant with regards to the machinery at Wet-Nap, one of the family and a friend of the De-Vries couple. This claim is not compatible with Mr Krystal’s version of events – which the Adjudicator found to be trustworthy – under which significantly before the development and improvement of the invention a partnership was created between Mr Krystal and Mrs De-Vries due to his technical experience and knowledge of patents and that the entire time he thought he was a co-inventor. The basis for this conclusion is explained below. No-one disputes that in September 2002 Mrs Liat De-Vries approached Mr Boaz Krystal at her initiative whilst Mr Boaz Krystal was at the factory for a meeting with her husband Mr Ilan De-Vries, and she shared her idea with him and requested that he develop it, so that she could benefit from his professional ability and technical expertise. Under cross-examination , Mrs De-Vries acknowledged several times that she did not consider it necessary to sign Mr Krystal on a Non-Disclosure Agreement before explaining the idea to him (Mrs De-Vries: Page 117 lines 16-18 and page 121 lines 5-7 of the Protocol). From this action, since she was acting Head of Development at Wet-Nap, one can deduce that she did not think that she was disclosing anything that required secrecy from Mr Krystal. Mr Krystal was willing to cooperate with Mrs De-Vries and immediately made some preliminary sketches of the product (Page 150 lines 23026 and Page 154 lines 1-2, 10-15 of the Protocol). It is apparent that during that meeting or after it, Mr Krystal and Mrs De-Vries agreed that they should work together to defend the invention by filing a patent application. Consequently Mrs De-Vries approached a patent firm where a relative, Patent Attorney David De-Vries, worked. As Mrs De-Vries herself testified (first Statement Paragraph 33), Patent Attorney David De-Vries was a professional that provided IP consultancy services to Wet-Nap even prior to working on the application in question. Mr Krystal agreed to work with this patent attorney despite the fact that he had used the services of a different patent attorney for earlier projects, but only after meeting with him on 25 September 2002 to examine his work. (Mr Krystal – Page 151 lines 21-25 of the Protocol). The Adjudicator considered that this agreement of Mr Krystal itself supports his claims, since, if the parties did not consider themselves partners, it us unlikely that they would have required Mr Krystal’s consent. This is why we turned to a patent attorney, an agreed choice of patent attorney. he [presumably Krystal-MF] new well that he [presumably David De-Vries – MF] was my cousin. At that time Boaz (Krystal) could have said sorry, I don’t want David, I want Yaakov, and I would have agreed to that, it would have been legitimate. (Ilan De-Vries, Page 85 lines 13-17 of the Protocol). It is agreed by all parties that Mr Krystal and Mrs De-Vries were present at all the meetings with Patent Attorney David De-Vries on 9 October 2002 and 15 October 2002. The Adjudicator sees this as evidence that this was a joint invention with two owners. provided evidence supporting the claim that Mr Krystal was not an inventor. Firstly it is not rare for patent attorneys to sketch out figures during meetings with Applicants. This isn’t even sufficient to make the patent attorney a further inventor. Additionally, this sketch by Patent Attorney David De-Vries does not carry the names of the proposed applicants. Furthermore, it is self-evident that on the submission of the application by Patent Attorney David De-Vries, there were two applicants – Mr Boaz Krystal and Mrs Liat De-Vries. Attorney David De-Vries, Mrs De-Vries forwarded a copy to Mr Krystal. Furthermore Mrs Liat De-Vries ensured that Mr Boaz Krystal signed a Power of Attorney for the Application. As is known, unlike Applicants, inventors who are not applicants do not need to provide Powers of Attorney. The combination of the above points to Mr Krystal being a significant element in the development of the claimed invention, otherwise his involvement would not have been required. It is emphasized that during the period in question, Mr Krystal was not an employee, so this cannot be considered a service invention under section 132 of the Patent Law. The Opposers made no claim that Mr Krystal was signed onto a statement to the effect that he’d merely provided technical support and was not an inventor, and was obliged to secrecy and not to use the invention. Furthermore, unlike with regards to the designer, Mr Hadar, the Opposer could not point to any compensation given to Mr Krystal for his technical help given to Mrs De-Vries in respect to the invention (Ilan De-Vries, Page 94 lines 10-14 of the Protocol). It may be summarized that Mr Krystal behaved as an owner with respect to his contribution which was given without any guarantee of remuneration as a consultant/designer/technician. Furthermore, Mr Krystal was actively present at the meetings with the patent attorney for drafting the patent application for the invention. That he behaved as an owner can be learned from Mr Krystal’s interaction with both the Patent Attorney and the graphic designer, giving both explanations with regards to the figures. Mr Krystal translated the patent application into Hebrew at his own expense so as to give his comments. He even requested that he transfer half the cost of the patent attorney’s work to Wet-Nap (Appendix 7). However, in his version of events that was considered convincing by the Adjudicator, at that stage there was already a falling out and he never actually paid his share. In the days leading up to the filing, Mr Krystal surreptitiously recorded conversations with Mr Ilan De-Vries and provided a transcript of relevant sections that appear to support his version of events. The full recordings were provided and whereas the transcript is selective, it is an accurate copy of the recorded conversation. There was an attempt to have this evidence thrown out, as it was not produced prior to the hearing, but the Adjudicator decided to allow it. The reason for making the recording was that even at that stage Krystal felt that the De-Vries couple were trying to block him out. The allegation that Mr Krystal’s name was included as an applicant by an office error made by a member of staff at Reinhold Cohn is rejected. It is weak, unconvincing and unsubstantiated. The Opposers should have but failed to produce an affidavit from those involved in the alleged error to support the claim. Re: New Israel Application for a package of wet-wipes with an auxiliary package for formulation in the names of (1) Liat De-Vries and (2) Boaz Krystal. We are delighted to inform you that on 14 November 2002 we submitted the above-mentioned application to the Israel Patent Office […] at your request, the patent was submitted in the names of Liat De-Vries and Boaz Krystal, whereas the communications and invoices will be sent to Wet-Nap Ltd. […] we have not yet received your Powers of Attorney and two POAs are appended, one in the name of Liat De-Vries and the other in the name of Boaz Krystal. According to the Opposers, Mr Ilan De-Vries wrongly thought that the patent application included two inventions; the package and the machine for making the package. According to Mr Ilan De-Vries, the package was his wife’s invention and the machine was Mr Krystal’s and, this was why, he claimed, it was appropriate to mention both names as Applicants. Mr Ilan De-Vries claimed to have been under pressure prior to a trip abroad on 13 November 2002 and was not free to go over the application. Consequently he mistakenly approved the filing with both Mrs Liat De-Vries and Mr Boaz Krystal being named. The Adjudicator did not accept this version of events. She was impressed that Mr De-Vries was a CEO who managed the sections of his company in a careful manner. One assumes that a professional CEO will ensure to be involved in the details of the company and its products and certainly of the patents that are anticipated to yield profit. Additionally, the various testimonies there is no compelling evidence that an additional invention of a packaging machine by Mr Boaz Krystal was discussed with either Mr Ilan De-Vries or with Patent Attorney David De-Vries. Furthermore, the covering letter to the draft patent and the letter reporting the filing both include bold emphasized titles which relate to the package only and not to a machine for manufacturing packages. There is also no explanation for the delay of almost a month from when the application was reported until the alleged mistake was realized. Also the transcript and the recordings that Mr Boaz Krystal submitted make no reference to a mistake in understanding the nature of the claimed invention. The Adjudicator expected that were Mr Ilan De-Vries to have made such a mistake he would have tried to fix it. It is surprising to her that it was Mrs De-Vries who worked to correct the apparent mistake and to have Mr Krystal’s name deleted as Applicant, so she rejects the claims of an office or other mistake with the Application. She also cannot ignore the letter from Mr Boaz Krystal to Mr De-Vries from 12 November 2002 that expresses grave fears that he would not be named as an applicant, but in the event, there is no argument that an oral instruction was made to file the application in both names. The Opposers chose not to bring testimony from the secretary at Reinhold Cohn who discussed with Mr Ilan De-Vries and requested his agreement to file in the names of Mr Boaz Krystal and Mrs Liat De-Vries. However, the Opposers blamed Mr Krystal for not summoning her. The Adjudicator rejected this argument since the onus was on the De-Vries to prove their case and their failing to bring this evidence works against them. (See Appeal Noa Sharon vs. Yosef Levy, paragraph 760, 16 December 1980). In this regard, the Adjudicator noted that the Opposers also claimed that the secretary in question no longer worked for Reinhold Cohn but did not consider that this piece of evidence was unobtainable. The balance of evidence and testimonies and the presumptions of the case-law were found persuasive to tilt the scales in favour of Mr Krystal being a joint-inventor and consequently an owner under Section 1 of the Patent Law. His rights as an owner were never assigned and he never consented to giving up on his rights in any agreement and there is no law that denies him his rights as an owner. He is named as an applicant and this provides a presumption of ownership under Section 76 which the Opposers have not succeeded to undermine by proving that Mrs De-Vries is the sole invention and owner. They failed to substantiate their claim that an office or other mistake resulted in him being named as an applicant. Consequently, Mr Krystal should be regarded as a joint-owner of IL 152867 and the opposition is dismissed. The Opposers should pay 15000 Shekels + VAT within 30 days, or incur interest, etc. Ms Shoshani Caspi’s ruling seems solid. The Opposers’ allegations and explanations as summarized are full of contradictions. Even a CEO with no English would be expected to see from the Hebrew title and the Figures that the patent application related to a product and not to a machine for manufacturing. Where the CEO is the husband of an inventor and inadvertently listed someone as a co-inventor with his wife, as a husband, one would imagine that he would put this right himself, rather than leaving it to his wife to take care of. I think however, that this ruling is a missed opportunity. From this ruling it seems that the last time the issue of what was considered inventing was ruled on by the Israel Patent Office was back in 1964 in a non-published decision. (Apart from the Copaxone case where Patent Attorney Cynthia Webb claimed part ownership based on her graduate work at the Weizmann Institute, I don’t recall this issue being discussed in an Israeli decision over the past decade that I’ve been blogging). If there are relevant court rulings, one presumes that they would have been referenced. In the absence of such discussion, this decision could and should have clarified when, in a conceptual invention that requires development and industrial design, but arguably does not require further inventing, does inventing stop and engineering development start? One assumes, since it is of critical importance in the US, but of importance everywhere, that at the time of filing, Reinhold Cohn’s attorneys would have clarified who had invented what. They would then have checked up what the business relationship was between the inventors and why one party only should be considered the owner. Patent Attorneys tend to impress to their clients that being an inventor is not a matter of honour, but is rather an issue of fact, and lying could have legal ramifications such as invalidating subsequent patents and other legal remedies. The parties to this dispute were formerly friends who eventually accused each other of fraud. I suspect that the cost of the legal process vastly outweighed any income generated by the invention or the patent, but no doubt if this is not the case, Mr Krystal will now sue the De-Vries and Wet-Nap for royalties. It is said that wise people avoid doing business with friends and family. Perhaps this should not be limited to joint invention, but one should also refrain from providing legal services to family. In this instance, apparently Patent Attorney David De-Vries and the inventor Liat De-Vries’ husband Ilan are cousins. This makes his actions in this case and in the corresponding PCT application and national phase entries look even worse than they would merely because of the factual discrepancies. One wonders why Patent Attorney David De-Vries signed the request to ‘correct’ the office mistake that resulted in Boaz Krystal being both inventor and applicant by removing the non-relative as applicant? In his submission to correct the name of the applicants, Patent Attorney De-Vries acknowledged that Mr Krystal was an inventor but stated that his also being identified as an applicant was an office mistake which he apologized for. This gives the clear impression that this was a Reinhold Cohn office mistake, which seems to be how the Adjudicator understood this claim as well. Even if it was intended to imply an office mistake in the office of Reinhold Cohn’s client who was paying for the invention despite not listing itself as an applicant or a Microsoft Office mistake this is still a strange version of events as Patent Attorney David De-Vries presumably knew that an inventor is also the applicant unless he is assigns his rights or the invention is a service invention by virtue of the inventor being an employee of the owner. Patent Attorney De-Vries should have obtained an assignment or proof of employment, or submitted that though formally a subcontractor, effectively Boaz Krystal was an employee (which to my mind is a far more interesting legal argument), or some other justification. He should have anticipated Shimon Shalit’s rejection of the amendment and its underlying logic. the issue should have been cleared up immediately. Furthermore, if Mrs Liat De-Vries was an employee of Wet-Nap and apparently she was effectively the head of development, than her invention was presumably a service invention owned by the company which should have been listed as the applicant. There is a further problem. The Israel application was the priority document of PCT Application No. WO2004/043,824 and of the subsequent national phase entries. The sole inventor and applicant named in the PCT application is Ms Liat De-Vries. Consequently the subsequent US Patent Nos. US 7, 575,115 and US 7,055,686 both list Mrs Liat De-Vries as the sole inventor and owner. Now that the Israel Patent Office has ruled that Boaz Krystal is indeed an inventor and applicant he can request that the US patents list him as inventor, and without an assignment, he is the owner there and can license or sell his share to whoever he likes and claim income for any deals in the past. Regardless of ownership determination, the discrepancy between the inventorship of the Israel application determined by Patent Attorney David De-Vries and that of the subsequent PCT application that Reinhold Cohn also filed is problematic. Boaz Krystal could conceivably submit disciplinary charges against Advocate David De-Vries and against Reinhold Cohn alleging that they conspired with Liat De-Vries and Wet-Nap to defraud him of his rights. The de-facto discrepancy is hard to explain. This ruling could be appealed but Mr Krystal could claim that, if he wasn’t an inventor, was neither an employee nor signed an NDA and is not a patent-attorney or otherwise entitled to attorney-client privilege or a duty of confidentiality, that the invention was disclosed to him prior to being filed and is thus in the public domain. Even without this claim, he could claim that Mrs Liat De-Vries has admitted to having discussed her idea, both with Mrs Tal and with him prior to filing. In the absence of a duty of confidentiality, and there is no indication that Mrs Tal signed an NDA, this was a disclosure prior to filing. In Israel there is no grace period. Thus, had he been inclined, Mr Krystal could have argued that Mrs De-Vries’ contribution was in the public domain and he was the only inventor of the claimed invention. Therefore it seems to me that Mrs Liat De-Vries should let lying dogs sleep sleeping dogs lie, and has little choice but to agree to sharing ownership with him.